از ظهور فنّاوری چاپگرهای سه‌ بُعدی نزدیک به دو دهه می‌گذرد. اما در این زمان محدود، پیشرفتهای شگرفی در چرخۀ تولید محصول رخ داده است. به‌ طوری‌که، در بسیاری از مراکز صنعتی بزرگ از قبیل صنایع خودروسازی، تجهیزات پزشکی، صنایع نظامی و غیرمجاز این فنّاوری استفاده می‌کنند. اصطلاحاً به این گروه از فنّاوریها «نمونه‌ سازی سریع» گفته می‌شود. همانطور که می‌دانیم ساخت مدل به روش سنتی مثل استفاده از دستگاههای فرز و تراش فرایندی بسیار وقت‌گیر، مشکل و هزینه‌ بر است. درحالی‌که به کمک این فنّاوری می‌توان یک نمونه را به صورت لایه‌ لایه مستقیماً از روی فایل مدل سه‌ بُعدی آن، که توسط یکی از نرم‌ افزارهای که تهیه شده است، ساخت. یکی دیگر از کاربردهای مهم این فنّاوری، استفاده از آن در مباحث آموزشی و تحقیقاتی است که از دید دانشگاههای برتر دنیا مخفی نمانده است. بیشتر دانشجویان مهندسی در درس نقشه‌ کشی صنعتی با مباحثی همچون تجسم فضای سه‌ بُعدی و مجهول‌ یابی تصویر سوم با مشکل رو‌به‌ رو هستند، لذا نویسندۀ این نوشتار مدلهای فیزیکی تمرینها را به‌ کمک چاپگر سه‌ بُعدی می‌سازد و در کلاس در اختیار دانشجویان قرار می‌دهد. باتو جه‌به نظرسنجی و آزمونهای گرفته‌ شده بر روی تعدادی از دانشجویان مرد، که در درس نقشه‌ کشی صنعتی ثبت‌ نام کرده بودند. مشخص شد که بسیاری از آنها نسبت به استفاده از مدلهای سه‌بُعدی فیزیکی نگرش مثبتی دارند و نتایج آزمونها بهبود در کیفیت فرایند آموزش را نشان می‌دهد. Instructor, Engineering Graphics Center, Sharif University of Technology, Tehran, Iran. Although 3D printing is only two decades old, dramatic improvements have occurred in the production cycle. At the present time many big industrial centers, such as the automotive industry, medical equipment industry, military industries, as well as many others use this technology. This group of technologies is called rapid prototyping. Conventionally, model building with traditional methods such as the milling and turning process is very time-consuming, difficult, and expensive. With the help of this new technology a model can be directly made and laminated from a 3D model that has been developed by CAD software. Another important application of this technology is its use in educational and research areas. Engineering students are facing more and more with problems such as 3D spatial visualization. Therefore, the researcher built 3D physical models with the help of a 3D printer and gave them to students to use in class. According to surveys and tests taken on a number of male students enrolled in engineering drawing, it was found that most had a positive attitude towards the use of physical three-dimensional models and test results show improvement in the quality of the educational process. متقیپور، مهدی (1931). مطالعۀ مقایسهای دربارة هشیو های تدریس درس نقشهکشی صنعتی .1 فصلنامه آموزش مهندسی ایران. 5 (144)، 711-731. متقیپور، احمد و متقیپور، مهدی . 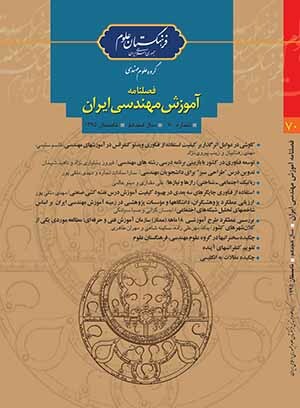 )1392( نقشهکشی صنعتی 1(به شیوة مدرن.) تهران: آفرنگ. AR-related courses at the KABK, TU Delft and Leiden University - See more at: http://www.arlab.nl/project/ar-related-courses-kabk-tu-delft-and-leidenuniversity#sthash.lKLK7acs.dpuf :http://www.arlab.nl/project/ar-related-courses-kabktu-delft-and-leiden-university. Chua, C. K., and Leong, K. F. (2014). 3D Printing and additive manufacturing: principles and applications, 4th Edition. Czapka, J. T., Moeinzadeh, M. H. and Leake, J. M. (2002). Application of rapid prototyping technology to improve spatial visualization, Proceedings of the American Society for Engineering Education Annual Conference & Exposition. Gibson, I., Rosen, D. and Stucker, B. (2015). Additive manufacturing technologies. 3D printing, rapid prototyping. and direct digital manufacturing, Second Edition, Springer. Mahindru, D. V. and Mahendru, p. (2013). Review of rapid prototyping-technology for the future, Global Journal of Computer Science and Technology Graphics & Visio, Vol. 13, Issue 4. Martín-Dorta, N., Saorín, J. L. and Contero, M. (2013). Development of a fast remedial course to improve the spatial abilities of engineering students. Journal of Engineering Education. Onyancha, R. M., Derov, M. and Brad, L. (2009). Improvements in spatial ability as a resultof targeted training and computer-aided design software Use: Analyses of object geometries and rotation types. Journal of Engineering Education. Serdar, T. and Roelof Harm deVries P. E. (2015). Enhancing spatial visualization skills in engineering drawing course, 122nd ASee Annual Conference & Exposition. Uria, E. S., Mugica, M. G. and Colindres, J. M. (2009). Methodology for part visualization problem solving (reading, interpretation and creation of multiview technical drawings), Proceedings of 17th International Conference on Engineering Design.